It's tempting to lay the alarming rise of white nationalism in the United States at the feet of Republican presidential nominee Donald Trump. Before him, after all, overt racism and hysteria about immigration were seemingly relegated to the margins of society and social media, a veritable sea of screeching Twitter eggs that has since been dubbed the "alt-right." But the grim reality is that right-wing activists have been working tirelessly for more than a decade to convince conservative voters that the biggest problem facing the nation isn't climate change or income inequality or health care access, but immigration, especially from Spanish-speaking countries. Through efforts focused on the state and local level, these activists have been quietly building conservative agitation over immigration, and it was this panic that led to the rise of Trump. The most important person in this movement just might be the secretary of state of Kansas, a guy named Kris Kobach. Even though his government position should be a full-time job, Kobach has a hefty side career going serving as the country's most tireless anti-immigration activist. Kobach drafts anti-immigration policies, peddles them to various states and municipalities and then offers himself as the legal defense for these policies when they are invariably challenged by civil rights groups. His one-man-band approach to activism has a propaganda arm as well: Kobach hosts a weekly two-hour talk radio show, where he peddles some of his more noxious ideas about immigration. He even takes credit for Trump's cockamamy plan to force Mexico to pay for a border wall by halting remittances — mostly meaning money sent by legal immigrants to their family members back home — until Mexico caves in to blackmail and pays for the structure. “Mr. Trump was receptive to that idea and I think he’s an excellent negotiator and he looks for opportunities to put pressure on opposing parties in negotiations and this fits the bill,” Kobach told the Topeka Capital-Journal in April. President Obama has called Trump's plan "half-baked" and noted that it would require tracking "every Western Union bit of money that’s being sent to Mexico." If that was indeed Kobach's idea, then it certainly fits his larger pattern. While Kobach and his supporters like to paint him as some kind of legal genius — highlighting his degrees from Harvard and Yale — the ACLU lawyers I spoke with emphasized that the legislation drafted by Kobach that he defends in court almost always falls apart when subjected to judicial scrutiny. “The laws he’s come up with are deeply, deeply flawed and almost never pass any kind of judicial scrutiny," Omar Jadwat, a senior staff attorney for the ACLU's immigrant rights division, explained over the phone. "These states and cities try to defend these laws in court, often paying Kris a bunch of money in the process." This is a pattern that crops up over and over: Kobach helps draft a bill and encourages states or cities to pass it; he then offers his help to defend it in court and eventually loses the case. But he emerges as a winner anyway because he can charge these government entities millions of dollars in legal fees to defend laws that he persuaded them to enact in the first place. As with the pervasive suggestion that Trump has used his presidential campaign to raise his own profile, Kobach's legal efforts have the strong whiff of a grift to them. "He gets to raise his profile, he makes some money off it, and the cities themselves are holding the bag," Dale Ho, the director of the ACLU's voting rights project, explained over the phone. "Either he’s misjudging the merits of these cases or he doesn’t care and is just using them as a platform for issues he cares about." Kobach did not respond to a request for comment. For years, Kobach worked primarily through the Immigration Reform Law Institute, helping draft laws such as Arizona's infamous SB 1070 — nicknamed the "papers, please" law — meant to harass and abuse immigrants or effectively anyone who might be perceived as "foreign." Wherever he has gone, Kobach has left wreckage in his wake. In Pennsylvania, California, Texas and Missouri, anti-immigrant laws based on model legislation written by the Immigration Reform Law Institute, and often defended by Kobach himself, were struck down in court, usually after millions of dollars and years of heartache. In Alabama, a statewide anti-immigrant law that Kobach helped draft slowly collapsed as the courts struck down multiple provisions, and others proved impossible to implement. Before it collapsed, however, Kobach ran around bragging about how he wrote the Alabama law on his laptop while sitting in a duck blind. Conservative activists held this out as evidence of his supposed genius, but in retrospect it looks like further proof that Kobach doesn't really put that much effort into making sure legislation that he drafts has a chance of holding up in court. In an email, the Immigration Reform Law Institute said Kobach used to write its model legislation but that he no longer does so, although the institute still employs him as an attorney to help with anti-immigration cases. But while he may have curtailed somewhat his activities of legislative writing for other states, Kobach is still at work doing that very thing in Kansas as an elected secretary of state. 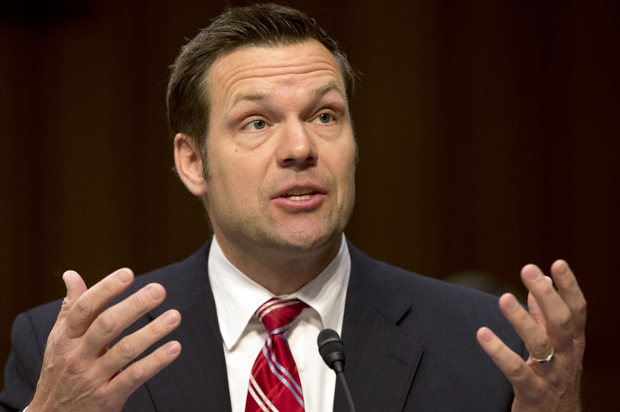 Kobach was instrumental in writing legislation that was later passed by the Kansas legislature, that would tighten voter ID requirements and requires people to bring proof of citizenship — such as a birth certificate — to the motor vehicles department if they want to register to vote while they get their driver's license. Kobach framed this as a necessary step to prevent voter fraud, playing on fears that noncitizen immigrants will illegally vote in the election. Like most states that have adopted Kobach-peddled legislation, Kansas has found itself tangled up in court in recent years, spending money to defend a bill that was ultimately quashed by the U.S. Court of Appeals in September. To make the situation even stranger, Kobach himself was defending the law in court, just as he has done in other states where he doesn't hold office. “Other election officials either have outside counsel or are represented by the state’s attorney general office," explained Ho of the ACLU. "But he’ll be there, taking depositions, questioning clients." That's "a little bizarre," Ho said, adding that it fits with Kobach's long history of DIY anti-immigrant legislation. Despite Kobach's enthusiasm for defending the law he helped write, he didn't do very well in court. A panel of the U.S. Court of Appeals for the District of Columbia ruled against the law, preventing Kansas "from adding a proof-of-citizenship requirement to a federal voter registration form," with "a federal elections agency — not the states — to determine whether such a change is ­necessary," according to The Washington Post. The overly harsh citizenship verification requirements would have excluded more than 17,000 eligible citizens from registering to vote, according to current estimates. "Thankfully, tens of thousands of eligible citizens in Kansas will be able to vote this November (or even now, in advance voting) because of ACLU lawsuits challenging Kansas voter access laws," said Micah Kubic, the executive director of the Kansas branch of the American Civil Liberties Union, in an email. "Were it not for those lawsuits, though, tens of thousands of Kansans would have been stopped from being part of the process." Even though he lost in court, Kobach kept fighting to keep thousands of eligible voters from having their votes counted in November. He tried to force such voters to use provisional ballots instead of regular ones. Only after he was threatened with contempt of court did Kobach cave, agreeing to let all eligible voters use normal ballots. He also agreed, however reluctantly, to let voters who had previously (and incorrectly) been told that they couldn't vote know that they are, in fact, legally registered. But while Kobach is spectacularly bad at passing and defending viable legislation, his efforts have not been entirely in vain. The laws may fall apart, but the media hoopla around the laws helps spread the erroneous notion that voter fraud is widespread and immigrants present a danger to democracy. The whole process of passing and defending anti-immigration and anti-voting laws gives racist activists a rallying point. The tensions that are stirred up linger for years after the laws themselves are struck down. As the Southern Poverty Law Center detailed in a 2011 report, wherever Kobach-backed laws are passed, an escalation of racist harassment and violence against Latinos is likely to follow. "Latinos reported being threatened, shot at, subjected to racial taunts and more," the report said. "Police are having trouble getting cooperation from any in their Latino communities. Pro-immigrant activists have been threatened with notes that promise to 'shed blood' to 'take back' communities." In his radio show, Kobach does his level best to stir racist fears and fantasies that immigrants and even native-born people of color are somehow out to get white Americans. In 2014, in response to a caller's accusation that Latino immigrants are "calling for the return of the Spanish territory, which could be almost half of the United States," Kobach played along, seemingly suggesting that white Americans are being threatened with "ethnic cleansing" by immigrants. "What protects us in America from any kind of ethnic cleansing is the rule of law, of course," Kobach said. "And now, of course, we have a president who disregards the law when it suits his interests." "It is maddening to be lectured about our Constitution and about what American law should be by aliens in the United States,” Kobach whined in August, after Khizr Khan, a Pakistani immigrant whose son died fighting for the U.S. Army in 2004, chastised Trump for his racism during a speech at the Democratic National Convention. In two weeks' time, Trump will likely have lost the election and will be quickly fading to Sarah Palin levels of irrelevance. But Trumpism — the recently coined word for Americanized white nationalism to which Donald Trump has given voice — will almost certainly survive. After all, Trump didn't invent this anti-immigrant hysteria. He's coasting on the work done by quieter but equally toxic figures like Kris Kobach, who have dedicated their lives to convincing white Americans that immigrants are out to get them. It's unlikely that Kobach and his supporters will abandon their crusade simply because their yapping orange figurehead goes down in flames.